Garland is a classic choice for Christmas decorating. These long green pieces add a touch of Christmas cheer to any home whether draped across a mantle or used on a doorway. A major advantage to using garland is variety, including natural garland or colored garland. 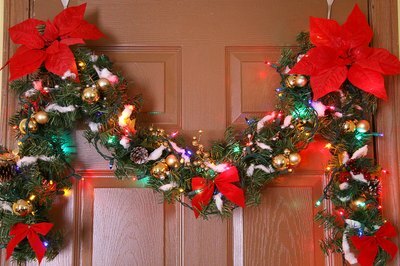 Whether you use it on interior doorways or the entrance above your front door, you can let others know that you’re in the Christmas spirit and ready for the holidays when you decorate with garland. Pick the type of garland you like. Evergreen garland is always popular, but you also can consider bay garland and some garlands made from leaves. You may find that you prefer artificial garland, as it keeps from season to season, while natural garland must be thrown away soon after the holidays. 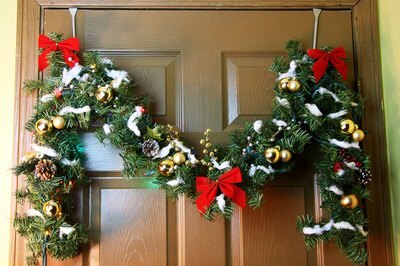 Attach two wreath hangers on your front door. Wreath hangers are made of plastic or metal and slide over the top of your door without causing the door to catch or stick. The fronts of the hangers have a curved edge or hook that holds a wreath (or in this case, the garland) in place. Set the garland on top of the wreath hangers, running it from one hanger to the other and letting it drape over the middle of the door. 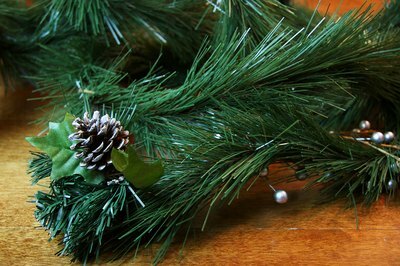 Trim the edges of the garland if it brushes the ground. 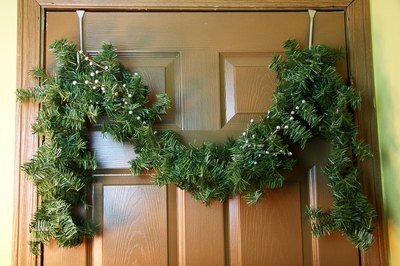 You may find it helpful to measure the doorway ahead of time and find a piece of garland that fits the space. 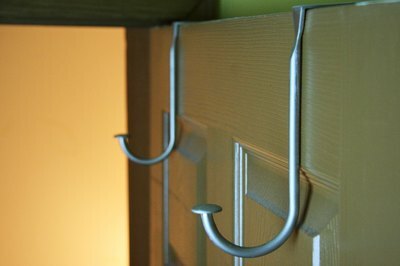 Use twist ties and attach red ribbon bows at both of the top corners on your door. Push the twist ties through the back of the ribbon and around the back of the garland. Add more ribbon bows if you like, or leave it with just two. Spray a light misting of artificial snow across the front of the garland to give it a winter look. Once the artificial snow dries, use twist ties to secure bulb ornaments and tree lights to the garland. If you prefer, wrap the garland with the lights before hanging.